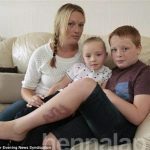 A boy of six could be left scarred for life after suffering an agonising reaction to a henna tattoo he had done while on holiday. Cade Bailey, from Poole, Dorset, had the dragon design painted on his forearm in Sharm-El-Sheikh, Egypt, two weeks ago. When he got home the black henna faded away but within a couple of days his skin reacted and he had a shocking raised burn. The itchy red rash is in the exact design of the tattoo, after chemicals added to the henna caused an extreme delayed reaction. His mother Michelle, 36, fears her son maybe permanently damaged by the tattoo and wants to warn other parents of the dangers. Experts believe the henna had been deliberately tampered with, by adding a form of hair dye to make the ink jet black instead of a natural brown. 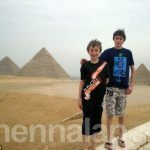 Michelle, who had been on a two-week holiday with Cade and her partner Graham Fletcher, 37, said many children at their hotel had the same tattoos. She said Cade had begged for a design from the local henna artist and she agreed, believing it to be totally safe. She paid around £12 for the large tattoo on Cade’s right forearm, which was supposed to last up to two weeks but erupted in a livid burn. Cade is now being treated with antihistamine tablets and steroid cream to reduce the mark, and wearing a bandage to protect his sensitive skin. Michelle, a full-time mother, said: ‘It was awful – it’s shocking to see. ‘We were having a lovely holiday and all of Cade’s little friends around the pool had had these henna tattoos done. ‘If I had any inkling it wasn’t completely safe, there’s no way I would have let him have it. ‘But I knew none of the other children had any bad effects from it and he had been mithering me all week, so I said he could get one too – everything seemed fine until 12 days after he’d had it put on. ‘We were back at home and the henna had faded, so his arm was completely clear. ‘I lifted his sleeve and saw this red, raised bump. It’s very painful for him and it’s burning hot to the touch. ‘I gave him antihistamine cream and tablets and took him to the doctors, but they weren’t aware of what it was. ‘It was only when I did some research on the internet that I learned about the hair dye they use which can cause this reaction. ‘I was absolutely horrified. It was terrifying to learn he could be scarred for life. He could suffer allergies to other things like suncream or hair dye now he’s been sensitised. ‘We’ve covered Cade’s arm with a bandage and he’s being treated with steroids, but we’re just going to have to wait and see whether there’s any permanent damage. Carl Stevens, a tattooist at White Flame in Bournemouth, said: ‘The skin has been burnt as it cannot take all the toxins. ‘It’s very probable that a form of hair dye was used on the boy’s arm. ‘It’s used as it last longer and is obviously a lot cheaper. It’s very thin, like ink, so essentially painted on. ‘It began in Spain around eight years ago, when tourists had the henna tattoos done abroad and suffered third degree burns, then they became more common in holiday resorts. ‘If you have a henna tattoo done once it’s OK, but if you have it done a second time then you can get severe burns which last.